The early reign of the Iberian king Vakhtang Gorgasali (447-502) saw the relative revival of the kingdom. Though formally a vassal of the Persians, he secured Georgia's northern borders by subjugating the Caucasian mountain peoples and brought the adjacent western and southern Georgian lands under his control. The Life of Vakhtang Gorgasali states that the king was given at birth the Iranian name Varazkhosrovtang, rendered in Georgian as Vakhtang. Gorgasali is an Iranian sobriquet meaning "wolf’s head", which must have been bestowed on him due to the shape of the helmet he wore. He led his people, in an ill-fated alliance with the Eastern Roman Empire, into a lengthy struggle against Sassanid Iranian hegemony which ended with his defeat and the weakening of the kingdom of Iberia. In 482 he led a general uprising against Persia and started a desperate war for independence that lasted for twenty years but could not get Byzantine support and was eventually killed in battle in 502. However tradition ascribes to him the reorganisation of the Georgian Church and foundation of Tbilisi, Georgia’s modern capital. Vakhtang is the subject of the 8th or 11th century vita attributed to Juansher which intertwines history and legend into an epic narrative, hyperbolising Vakhtang's personality and biography. This literary work has been the primary source of Vakhtang’s portrayal as an exemplary warrior-king and statesman, an image which has endured in popular memory to this day. He had already emerged as one of the most popular figures in Georgia's history in the Middle Ages and has been canonised by the Georgian Orthodox Church. Other medieval Georgian sources mention Vakhtang only briefly, yet with a respect rarely afforded to the pre-Bagratid Georgian monarchs. Vakhtang is reported to have succeeded his father King Mihrdat V at the age of 7. His mother, a Christianised Persian called Sagdukht, assumed the regency in Vakhtang's minority. The author then describes the grave situation Iberia was in at that time, troubled by the Sassanids' Zoroastrianising efforts and a ravaging raid by the "Ossetians" from the north, this being a possible reference to the invasion by the Huns (whose army may have included Alans) through the Caspian Gates mentioned by Priscus. At the age of 16 Vakhtang is said to have led a victorious retaliatory war against the "Ossetians", beating the enemy’s giant in single combat and freeing his sister Mirandukht from captivity. At the age of 19, Vakhtang married Balendukht, "daughter" of the Great King Hormizd (apparently Hormizd III, r. 457–459). Soon, upon the Great King's request, Vakhtang took part in a campaign in "India" and was probably involved in Peroz's abortive expedition against the Hephthalites in the 460s and also against the Roman Empire in 472, in which Vakhtang is reported to have gained control of Egrisi (Lazica) and Abkhazia (Abasgia). Returning to Iberia, Vakhtang took a series of measures aimed at strengthening royal authority. Resenting Iranian encroachments on his independence Vakhtang reversed his political orientation and effected a rapprochement with the Roman Government. 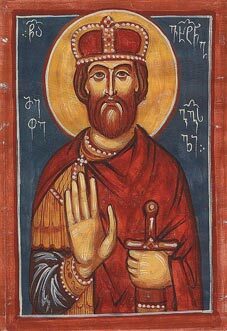 He married Helena, "daughter" (possibly relative) of Emperor Zeno, and received permission from Constantinople to elevate the head of the Church of Iberia, the Bishop of Mtskheta, to the rank of Catholicos, who he sent, together with 12 newly-appointed Bishops, to be consecrated at Antioch. By espousing pro-Roman policy Vakhtang further alienated his nobles, who sought Iranian support against the king’s encroachments on their autonomy. In 482 Vakhtang put to death his most influential vassal, Varsken, Vitaxa of Gogarene, a convert to Zoroastrianism and a champion of Iran’s influence in the Caucasus, who had executed his Christian wife, Shushanik, daughter of the Armenian Mamikonid Prince Vardan II and the hero of the earliest surviving piece of Georgian literature. With this act Vakhtang placed himself in open confrontation with his Iranian suzerain. Vakhtang called on the Armenian princes and the Huns to help him. After some hesitation, the Armenians under Vardan’s nephew Vahan joined forces with Vakhtang. The allies were routed and Iberia was ravaged by punitive Iranian expeditions in 483 and 484, forcing Vakhtang into flight to Roman-controlled Lazica (modern western Georgia). After Peroz’s death in the war with the Hephthalites in 484, his successor Balash reestablished peace in the Caucasus. Vakhtang was able to resume his reign in Iberia, but did not betray his pro-Roman line. Once the Hundred Years Peace between Iran and Rome collapsed Kavadh I of the Sassanids summoned Vakhtang as a vassal to join in a new campaign against Rome. Vakhtang refused, provoking an Iranian invasion of his kingdom. Then about 60 years old, he was obliged to spend the last years of his life in war and exile, fruitlessly appealing for Roman aid. The chronology of this period is confused, but by 518 an Iranian viceroy had been installed at the Iberian town of (Tbilisi) Tiflis, founded – according to Georgian tradition – by Vakhtang and designated as the country’s future capital. Vakhtang died fighting an Iranian invading army at the hands of his renegade slave, who wounded him through an armpit defect in his armour. The wounded king was transported to his castle at Ujarma where he died and was interred in the Cathedral of Mtskheta. Vakhtang might have ended his reign in 522 by taking refuge in Lazica, where he possibly died around the same time. Gurgenes’ family members – Peranius, Pacurius, and Phazas – had careers in the Roman military. Vakhtang was survived by three sons. Dachi, Vakhtang’s eldest son by his first marriage to the Iranian princess Balendukht (who died in childbirth), succeeded him as king of Iberia and was force to pay Iran allegiance. Two younger sons, from Vakhtang’s second marriage to the Roman Helena, Leon and Mihrdat, were given the southwestern Iberian provinces of Klarjeti and Javakheti in which Leon’s progeny – the Guaramids – traditionally followed a pro-Roman orientation. Both these lines survived in Iberia into the 8th century, being succeeded by their energetic cousins from the Bagratid family. Toumanoff has inferred that Samanazus, the name of the Iberian "king" found in John Malala's list of rulers contemporary with Justinian and reported by Theophanes the Confessor and Georgios Kedrenos to have visited Constantinople in 535, might be a corruption meaning "brother of Dachi" and so perhaps refers to Mihrdat. Vakhtang had already entered the pantheon of Georgian historical heroes in the Middle Ages. One of the royal standards of the Georgian Bagratids was known as the "Gorgasliani", i.e., "of Gorgasali". This is sometimes supposed to be the earliest model of the current Georgian national flag. In popular memory, Vakhtang's image has acquired a legendary and romantic facade.